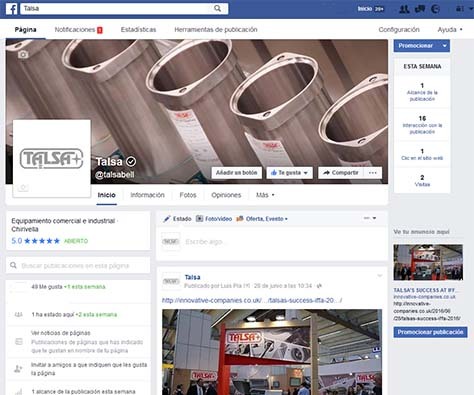 Talsa is an european leading company in the manufacturing of medium capacity machinery for the meat industry and an example of an innovative company committed to technology that actively pursues an online marketing strategy through Social Media. Talsa already counts with a corporate website in 6 languages on which an active policy of natural SEO positioning has developed for years. It focuses mainly on the positioning in English (its main language), German, French and Spanish. Now, it aims to go further and expand its marketing strategy with the presence on the main Social Networks. To that end, it counts with the support of Aitana Multimedia, a specialist on online marketing. Gain direct contacts through Social Networks. Improve the SEO positioning of its corporate website by generating content linked directly to the main Networks. In most cases, English has been chosen the official communication language given the company’s international projection. Special emphasis has to be made on Talsa’s YouTube channel, with thousands of views and a great amount of high-quality videos on their range of medium-capacity machinery for the meat industry.